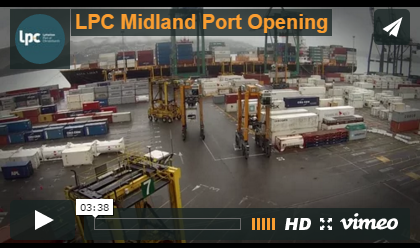 Lyttelton Port of Christchurch’s (LPC) new Inland Port at Rolleston, MidlandPort, is a step change in container freight efficiency for the South Island. It also future proofs the Port’s transport connections for Canterbury’s trade growth. It began operating in June and was officially opened today (14 October) by the Honourable Amy Adams, Minister of Justice and MP for Selwyn. “For the first time, container freight has a rail route between Rolleston and Lyttelton Port which provides the most comprehensive shipping service in the South Island,” said LPC Chairman Trevor Burt. “MidlandPort is providing unprecedented connectivity throughout the South Island for shippers in our region, giving access to the eight shipping services and 14 shipping lines that come to Lyttelton. “MidlandPort saves a journey to Lyttelton for customers. Import containers can be picked up here and export containers dropped off. It reduces empty container movements and saves time and money. “MidlandPort’s name reflects how it is at the heart of Canterbury’s trade, transport and productivity. It is strategically positioned at the intersection of major transport routes, with rail access to all points west and south of Rolleston. It also services the increasing productivity from the Canterbury plains. Irrigation is boosting exports such as dry and refrigerated dairy, frozen meat and vegetables. In central Canterbury 60,000 hectares of mostly dryland farms will be transformed by the Central Plains Irrigation scheme. That will increase agricultural output by about $264 million a year. “This facility is designed to service that growth. But it also provides many other benefits. It is improving travel time for freight transport and helping reduce road congestion. Each round trip rail service takes up to 80 truck trips off our roads. This is a positive step as our city focuses on improving transport efficiency. “After the earthquakes, transport planning recognised the need to establish a hub like this in Rolleston that connected to Lyttelton Port. We developed MidlandPort as part of our commitment to Canterbury and supporting the South Island’s long term trade growth. “Already we have welcomed major customers such as Westland Milk Products and The Warehouse on board. We are managing hundreds of containers here every week and volumes have tripled since we opened. “Our rail siding handles 30 wagon trains. We currently operate one train trip a day but this will increase as demand grows. We also store and repair containers and there is a Customs Controlled Area and MPI Transitional Facility, as well as having space for 168 refrigerated containers. MidlandPort is a vital part of our planning to be ready for the forecast 50% increase in exports and imports in the next nine years. This growth will make Canterbury stronger, provide more jobs and make Christchurch an even better place to live. “It will be great for the city and our region. As trade grows so do the size of the cargo vessels. We must be ready to accommodate bigger ships that will carry more cargo and we will need a deeper shipping channel in Lyttelton harbour so they have access. This is all part of our planning to future proof our operations. “Lyttelton Port is thriving and we need to ensure it stays that way. It helps our city and it vital to our prosperity as a nation. “We export billions of dollars of goods annually through our Port – that’s overseas earnings that are crucial for Canterbury. We have had a 50% increase in container volumes in the last five years. We handle in excess of half the South Island’s container volume, including more than 70% of imports. “Lyttelton Port is the gateway for trade to the South Island – and now we have MidlandPort which provides our exporters and importers with a new, more efficient gateway to the world.